Delicious Drinks For A Hot Summer Day For many, Memorial Day weekend is the unofficial kickoff to enjoying great summer food. But after breaking out the grill and the tasty new recipes, you might also want to consider serving up the right beverage. Guest host Allison Keyes turns to wine enthusiast Callie Crossley, who runs the blog The Crushed Grape Report. Crossley shares the recipes for her favorite chilled beverages. For many, Memorial Day weekend is the unofficial kickoff to enjoying great summer food. But after breaking out the grill and the tasty new recipes, you might also want to consider serving up the right beverage. Guest host Allison Keyes turns to wine enthusiast Callie Crossley, who runs the blog The Crushed Grape Report. Crossley shares the recipes for her favorite chilled beverages. Memorial Day can be the unofficial kickoff to a great summer season of tasty new food, but you'll need something to wash it all down, and the right tasty beverage to compliment your healthy new recipes. And so, as we do when we're thirsty, we turn to Callie Crossley. She's a wine connoisseur and runs the blog "The Crushed Grape Report." Here's Callie with her summer sipping favorites. Grab a pen so you can jot down notes on how to mix some of her favorite drinks. Ms. CALLIE CROSSLEY (Wine Connoisseur; Blogger, "The Crushed Grape Report"): I wasn't born in the peach state of Georgia, but my dad nicknamed me peaches for reasons known only to him. Maybe that's why I have a particular fondness for peachy drinks during the summer. My favorite, the Bellini. It's a champagne based drink created back in 1931 at Harry's Bar in Venice, Italy. Now, there are many versions of this drink, but I like to kick off the summer with the upscale version. But don't let the upscale factor intimidate you. It's actually easy to whip up. You'll need two or three white peaches. You can always use yellow if you care to simplify things. Slice up the peaches and puree them in a blender. Ms. CROSSLEY: Then find a champagne flute. Ms. CROSSLEY: And fill the bottom of it with about two ounces of the peach puree. Next, pour chilled, dry champagne over the fruit. Ms. CROSSLEY: Use a long spoon to gently stir the puree up from the bottom of the glass. Ms. CROSSLEY: And, finally, garnish with a peach slice, or for contrast, grab a strawberry. Enjoy. Now, there is also an even quicker but not so fancy Bellini recipe. It's made without the actual peaches, but it's big on peach taste. This version is a natural for summer because it's icy cold, literally. And it's a simple recipe. You'll need one ounce of peach nectar. Ms. CROSSLEY: You can usually find it in the grocery store on the aisles with the juices. One-half teaspoon of fresh lemon juice. Ms. CROSSLEY You'll also need one-half ounce of peach schnapps liqueur. Ms. CROSSLEY: And one-fourth cup of crushed ice. Ms. CROSSLEY: Now put it all in a shaker and shake it up. Ms. CROSSLEY: Then pour it into a chilled glass. Ms. CROSSLEY: And top it off with chilled, dry, sparkling wine. Ms. CROSSLEY: Simply wondrous, especially on a hot, humid day. This next drink is not a peach drink, but the d'Artagnan is another one of my favorite summer cocktails. And, yes, it is named after the swashbuckling character in the movie and the book "The Three Musketeers." Here's how to make it. In a portable container, now, you know, we Southerners like a glass jar with a screw top, mix one teaspoon of brandy. Ms. CROSSLEY: One teaspoon of Grand Marnier. Ms. CROSSLEY: And three teaspoons of fresh squeezed orange juice. Ms. CROSSLEY: Cut long strips of orange peel to use for garnish. Next, add one-half teaspoon of simple syrup, which is half sugar, half water combination boiled until it makes a clear syrup. Ms. CROSSLEY: Mix all ingredients. Then go grab a bag of ice, some bottled water and a bucket to take with you on that summer picnic. Once you unpack your picnic basket and are all set to eat, do what I call a quick on-the-picnic-blanket chill by dipping the glasses in and out of the icy water. Ms. CROSSLEY: When ready to imbibe, add chilled sparkling wine. KEYES: That was wine connoisseur and blogger Callie Crossley. You can find a link to her blog "The Crushed Grape Report" by going to our Web site. You can also find the drink recipes you just heard by logging onto NPR.org. Click on Programs and then on TELL ME MORE. Slice up the peaches and puree them in a blender. 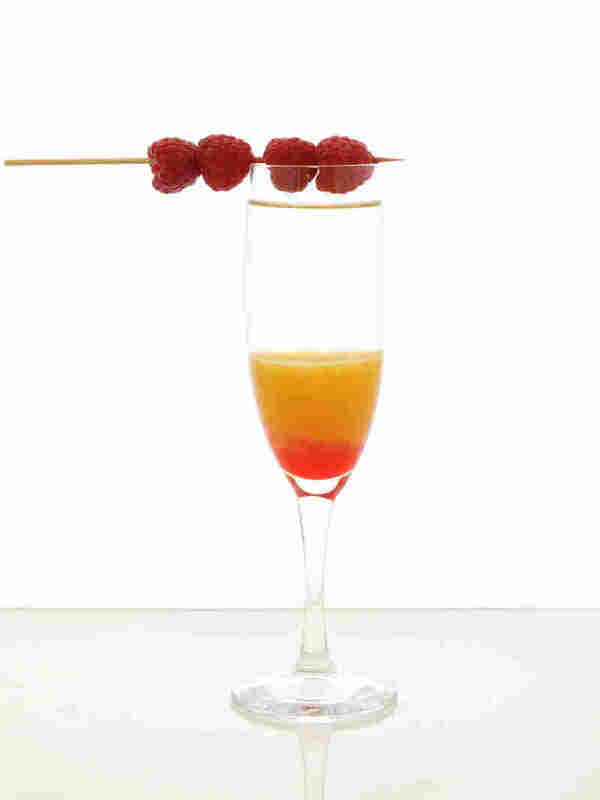 Fill up a champagne flute with about two ounces of the peach puree. Top with sparkling wine (or champagne). Garnish with a peach slice or berries and enjoy! Combine all the ingredients in a shaker and give it your best shake. Pour into a chilled glass and finish it off with dry sparkling wine. Simply wondrous, especially on a hot humid day. In a portable container, mix the Brandy, Grand Marnier, orange juice and simple syrup. Pour into a chilled glass and top with sparkling wine. Garnish with strips of orange peel and indulge! Summer Tip: To chill glasses at a picnic, simply bring along a bucket, water and ice. Once you unpack your picnic basket and are all set to eat, do what I call a quick on-the-picnic-blanket chill by dipping the glasses in and out of the icy water.